Notes: Crimson Prep for Beanpot - College Hockey, Inc.
Fox leads Harvard in pursuit of its second Beanpot title in three years. Adam Fox could become the first junior defenseman in seven years to reach the 100-career-point milestone. Richards' breakthrough for UMD – A year ago Justin Richards (Columbus, Ohio/Lincoln-USHL) played a key role on the national champion Minnesota Duluth Bulldogs, even if it didn't often show up on the scoresheet (0 goals, 9 assists on the year). He won key faceoffs and played a checking line role in a season he originally planned to spend playing a final year of junior hockey. 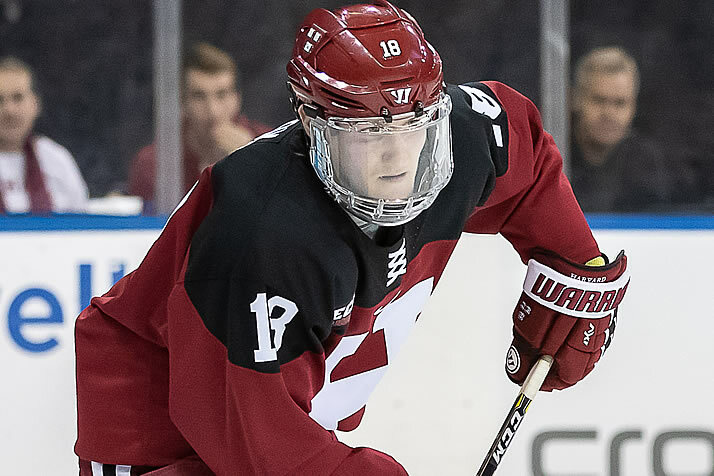 Now, with that year of experience, the son of Tampa Bay Lightning assistant coach Todd Richards has become one of the most improved offensive players in college hockey, producing a point per game (8-16—24 in 24 GP). He has at least a point in 18 games this year, tied for the most among any freshman or sophomore in the nation. Rookies fuel Niagara – Niagara stands 9-7-3 in Atlantic Hockey, fueled by the conference's top offense. The nation's top-scoring freshman class has sparked the Purple Eagles, led by rookie Ludwig Stenlund (Skellefteå, Sweden/Madison-USHL). Goals in four straight games and six of the last seven give Stenlund 11 on the year, which leads the nation's rookies. OSU's secret weapon – Ohio State enters a series featuring the top two teams in the Big Ten (vs. Notre Dame) at No. 4 in the polls and winners of three straight. In this "year of the defenseman" in college hockey, the Buckeyes' top blueliner may be one of the most underrated: senior Sasha Larocque (Calgary, Alta./Dubuque-USHL). The defensive defenseman leads OSU at +13 and was second-team All-Big Ten last season. The earth sciences major is just a few years removed from nearly giving up hockey before current Arizona State assistant coach Mike Field convinced him to join the USHL's Dubuque Fighting Saints in 2014-15. The Headway Foundation, a nonprofit founded by former college players to address concussions in hockey, is holdings its annual Concussion Awareness Weekend this weekend; learn more at headwayfoundation.com … Only one series this weekend is out of conference: Arizona State at RIT … New Hampshire junior Liam Blackburn (Prince George, B.C./West Kelowna-BCHL) boasts the longest active point streak in the nation and the longest of the season at 15 games (9 goals-12 assists) … Mercyhurst defenseman Joseph Duszak (Franklin Square, N.Y./PAL Jr. Islanders-USPHL) led the nation in goals (9) and points (17) in January.